Now that you’ve learned how to pick the perfect suitcase, it’s time to discuss the pros and cons of different ways to fill it. Packing is tougher than you think. After all, it’s not just what you should bring, it’s how you should bring it. Read on for a packing primer, plus my favorite packing hacks for maintaining an orderly but fashionable suitcase. Got any tips of your own? Feel free to share them in the comments! Montagues vs. Capulets. Red Sox vs. Yankees. Rollers vs. folders. The old standby. Folding your clothing works best for garments with sturdier fabrics, such as denim jeans or chambray blouses. To ensure your garments don’t wrinkle, fold on a flat surface (an ironing board or, in a pinch, the floor). Shirts can be tricky: Tuck sleeves in first and then fold the torso of the garment in thirds. Consult Real Simple‘s How to Fold a T-Shirt video for maximum skills. Many travelers maintain that rolling garments saves space in your bag (and, in fact, I’m a fans of this method myself). Rolled clothing won’t show the deep creases that folded garments get after a long flight. The rolling method works best for softer fabrics that are less likely to wrinkle, such as cotton and wool. For shirts and dresses, simply fold the sleeves over the torso of the garment and roll from the neckline down to the hem. Then smooth any visible wrinkles toward the seams and bottom of the item, where the weight of the garment will smooth out wrinkles the fastest. This may be the best method for chronic overpackers who simply won’t change their ways. Compressing involves placing folded clothing in a sturdy plastic bag (like these from Travelon) and rolling the bag to force additional air out, thus saving space. The upside is that you can fit a whole lot of clothing into a compression bag once you remove the air. The downsides? Compression bags can be large and unwieldy, and packing them requires extra work. You may be tempted to overpack, since they really do give you more room. (And this could lead to some fun overweight-bag fees. Did I say fun? I meant the opposite of fun.) Furthermore, compressed garments wrinkle easily. This is definitely the best method for long trips for which you need a lot of clothing—not so useful for weekend getaways or for maintaining a crease-free Diane von Furstenberg wrap dress. If you feel that you could benefit from a little more organization in your bag (I’m right there with you), a number of outfitters make packing tools that can keep your bag tidy. 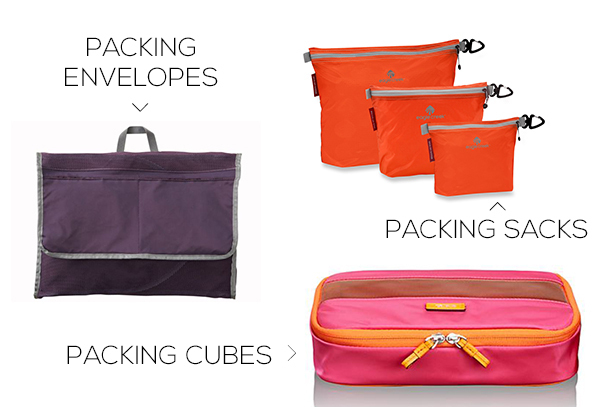 Packing cubes are great organizational aids for maximizing space in your bag. They categorize items and store them separately, making it easier to find exactly what you need in your suitcase. The downside is that they’re pricey. (We love you, Tumi, but a single cube for $45 apiece?!) If you’re on a budget, you can use gallon-sized freezer bags—they do the exact same thing for a lot less money. Another organizational aid, packing folders or packing envelopes offer the same efficient space-saving functionality as packing cubes, but they’re better at keeping your clothing wrinkle-free. Many, like these smart packing envelopes from TravelSmith, come with boards to make folding easier. But know that any folded garment is still liable to crease along fold lines. These are good options if you’re toting lots of button-up shirts or blouses. The most freeform of the packing aids you’ll find, packing sacks are like cubes but in softer bag form. They won’t keep clothing wrinkle-free, but they’re a great hiding place for belts, jewelry, hair-styling tools, shoes, and other necessaries that you don’t want to toss into your bag willy-nilly. I like these fun neon packing sacks from Eagle Creek; they’re partially transparent, so you can see what’s inside without tearing open each bag. Now that you have the basics, here are some of my favorite packing hacks, gathered from years of trial, error, and inspired experimentation. Roll your underwear and socks and place them in your shoes or boot shafts. You can also place scarves, mittens, or even lightweight T-shirts in your shoes for maximum space-saving. Organize your bag by outfit if you want to save time getting dressed in your destination. I fold outfits into “units” and place them in my bag together rather than placing all my sweaters in one pile, all my jeans in another, and so on. That way, I won’t rummage through my bag for a certain item, and my wardrobe is already picked out for me. To keep everything fresh, toss in a dryer sheet. I love the springy scent of Seventh Generation’s lavender dryer sheets so much that I don’t bother schlepping perfume anymore. To erase wrinkles in a pinch, pack a travel-sized bottle of Downy Wrinkle Releaser and spritz your garments on the go. Before leaving, double-check your bag and remove anything you are not 100 percent sure you will wear or use. Be mercenary. Those loafers with the cat faces are adorable. You will not wear them. Up next: Day 4: Surprising Ways to Streamline Your Suitcase.